Church History: Studies in Christianity and Culture is a quarterly academic journal. 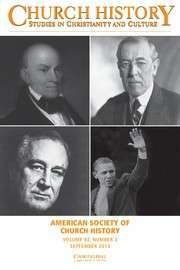 It is published by the American Society of Church History and was established in 1932. It is abstracted and indexed in the ATLA Religion Database. The editors-in-chief are Andrea Sterk (University of Minnesota), Euan Cameron (Union Theological Seminary, Columbia University), Dana Robert (Boston University) and Jon Sensbach (University of Florida). The journal is regarded as highly authoritative in its field, and is compared to the British Journal of Ecclesiastical History. ↑ Hein, David; Shattuck, Gardiner H. (2004). The Episcopalians. Greenwood. pp. 333–34. ISBN 9780313229589. ↑ "Church History: Studies in Christianity and Culture". Homepage. American Society of Church History. ↑ "Title and Product Update Lists". ATLA Religion Database. American Theological Library Association. Retrieved 2015-03-10. ↑ Bradley, James E. (1995). Church History: An Introduction to Research, Reference Works, and Methods. Wm. B. Eerdmans. p. 90. ISBN 9780802808264.